Mrs Pascoe's final year of Maypole dancers gave a performance (on the playground) to the whole school. Mrs Pascor has been training Maypole dancers for over 10 years. This year there have been 22 children from years 3 and 4. The Maypole team have been training on Wednesdays after school for 9 weeks. After half term they will be dancing at the Parham Summer Fete, the School Summer Sports Evening and the Saxtead Fete. The final round of the house cricket league still had 3 possible winners. Mills put in a brilliant performance with the bat to score a massive total vs Howard.. This gave them 2 wins. The other match saw a very close finish. Bulstrode beat Hitcham off the last ball. This gave Bulstrode 3 wins and left Hitcham with only one win. Bulstode deserved to win this year because of their alround quality. They have batted and bowled well and crucially have taken lots of catches. There is an old cricket saying: 'Catches win matches'. Bulstrode captain with the trophy. All of the teams. Bulstrode 1st, Mills 2nd, Hitcham 3rd and Howard 4th. This Friday there is a school team trial match. A and B teams will be slected after this for the district tournament on 16th June. The school chess competition has been running since February. After some lengthy semi finals we got down to the last 2 players. Billy and Jake played out a high quality match spread over 3 lunchtimes. Jake eventually emerged as the winner and Billy as runner-up. Well done to both of them. FRIENDS AFTER SCHOOL FUN SWIMMING IS CANCELLEDThe Friends are cancelling the after-school swimming because they have had no further responses to their requests for help and cannot run the sessions without sufficient helpers. FRIENDS CAKE STALL – FRIDAY 27 MAYClasses EM & CA are baking cakes for sale this Friday; do remember to bring some pocket money to buy a treat after school from the pavilion on the front playground. Alcohol to be given in at the office please. FRAMLINGHAM COMMUNITY BAPTIST CHURCH EVENTS - 29 MAY to 5 JUNEA week of special events is being held under the title of ‘For God’s Sake!’ It includes a Kids club on 31 May & 1 June from 10am-12pm, and 2 June 2-4pm at St Michael’s rooms. Contact Edith Peck on 01728 724859 for further details. Many other events are going on. Please see the parent notice-board for more details. FRIENDS SUMMER FUN EVENING – FRIDAY 10 JUNE 5-8pmThe Summer Sports & Fun evening will be held from 5-8pm on the field. In addition to the local sports clubs coming in to do ‘Sports and Games’ with the children, there will be a Bar, Pimms Bar, BBQ, Tuck Shop, Bottle Tombola, Children's Tombola, Cake Stall, Toy & Book Stall, Maypole dancing and lots of other fun stalls to have a go on. TESCO VOUCHERSJust a reminder that this is the last week for collecting Tesco vouchers; if you still have any to bring in the box will be outside the office until Friday 27 May. Thank you. FUNDRAISING CAKE SALE & FETE - Friday 17 June and Sunday 19 JuneWe have been asked by some friends of a family at school (who currently have a seriously ill baby in Addenbrokes Hospital), to advertise that they wish to raise some funds to help the family with their transport and accommodation costs during this stressful time. 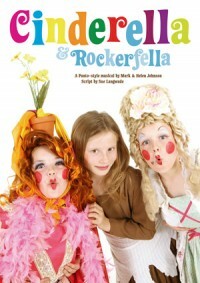 They are asking if any kindhearted family would bake a cake for a sale on Friday 17 June. They are using the front playground pavillion at 3pm that day to have the sale. Cakes can be brought into school in the morning. In addition, the friends of this family are having a Fete in Kettleburgh on Sunday 19 June from 2pm - 4pm. Please go along if you can. HALF TERM – 30 May – 3 JuneNext week is half term, the children return to school on Monday 6 June. The district hockey tournament took place yesterday at Debenham High school. There were 15 teams taking part (a big increase on last year) including 2 from Framlingham. The teams were divided into 4 groups. Framlingham A team won all 3 of their group matches to finish top of their group. Fram B finished their group as runners up from 1 win and 2 draws. In the quarter finals Fram A beat Debenham 3-1 and Fram B beat Occold. Our A and B teams then played each other in the semi finals. The A team won 3 - 0. Fram A then won a very close and exciting final v Halesworth Middle School. The game went to extra time with Fram winning 2-1 thanks to two goals by Adam Blades and superb defence from Billy Caiger, Georgina Warren and Edward Goddard. Fram B won a playoff to finish 3rd - a great performance by a team of year 5 children. Indded Guy Blades finished as the tournament's top goal scorer. They should make another strong A team next year. A new group of cyclists have started on a course run by Mr Byer, Mrs Eyles and Mr Mulrenhan. This year there are over 50 children taking part in 2 groups. This huge painting (in the school hall) is by all of the children in Class JC - Years 1 and 2. It represents the Creation Story. Click on it for a full size version. 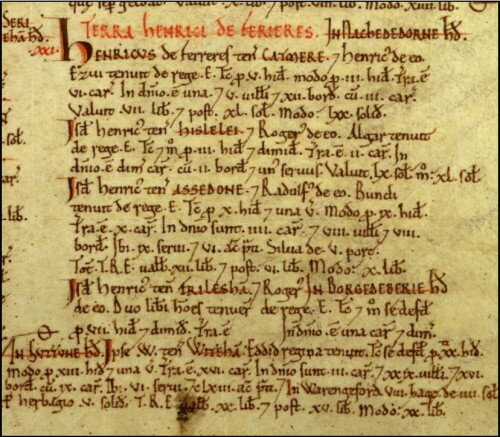 The Domesday Book was written in 1086 by William the Conquerer. It was the first ever national census. Every town or village in England was listed along with its contents - buildings , people and animals. 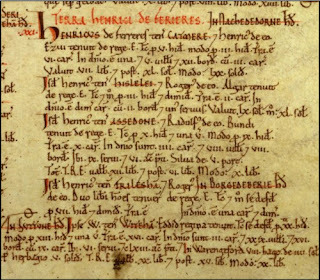 The picture above is of the original Domesday Book. Below is an extract from one of the pages. The Framlingham entry in the Domesday book refers to Roger Bigod as sheriff of Suffolk and landowner. 1986 was the 900th anniverary of the Domesday Book. A national event took place to commerate the 900th anniversary. It was called the Domeday Project. The article below was written in 1986 about life in Sir Robert Hitcham's School. This was written by a child in year 3 in 1986 when Mr Gilder was Headteacher. Can you notice any similarities or differences with life at Sir Robert Hitcham's today? In 1986 there was no internet! 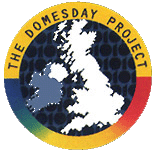 To mark the 25th anniversary of the BBC have put the information collected (in 1986) on to a new webbsite - called Domeday Reloaded. Click on Domeday reloaded to go to the new BBC website - where you can see this article and 20 others about Framlingham - all written in 1986.. It is interesting to see how Framlingham ha changed over the years. On Friday the 13th of May the School took a ‘A’ and a ‘B’ team to the New Image Rugby Tournament at Hartismere High School in Eye. The ‘A’ team did incredibly well to win all of their games (8 matches) and win the tournament overall. The team consisted of Adam Blades, Carl Mayhew, Ewan Maclean, Billy Caiger, Georgina Warren, Mia Mayhew, Athena Hanson Aherne and Molly Constanti and Jake Warren. The 3 top try scorers were Adam Blades with 18, Ewan Maclean with 9 and Carl Mayhew with 7. Others scored several tries as well. Overall the whole team played fantastic in offence and defence. Although not winning all of their games the ‘B’ team had some brilliant passages of play. The team included Daniel Last, Bilal Bounit, Edward Goddard, Sam Baker, Mollie Waddell, Jasmine Prime, Erica,Nathan and Poppy Able and Anthony Picton. The ’B’ team won 4 games and drew 2 finishing 5th out of the 9 teams with Bilal Bounit, Edward Goddard scoring the majority of tries. Click on the picture above to go to the website (of the Cinderella writers) to find out nformation about the play and to listen to samples of the songs. The children have already held auditions for the main parts. Rehearsals start this week - everybody has 10 songs to learn. On Wednesday 13th May reception classes CH, PS/KM plus the Nursery celebrated a role play weding at St .Michael's Church in Framlingham as part of a Royal Wedding Topic. Reverend Graham Owen guided the children througha taditionnal Christian service including the signing of the register. The service was then followed by many photographs and confetti. Back at school we held a reception which included food (ice buns) and dancing. It wa a wonderful occasion thoroughly enjoyed by everyone. The groom and best man before going into church. The 2nd set of matches saw Mills pput in a much improved performance. They posted a huge score when batting first against Hitcham to win by nearly 80 runs. In the other match Bulstrode continued their impressive start to the season with anothe good win v Howard. Next week will see Bulstrode play Hitcham - can they make it 3 out of 3? and Mills play Howard. The annual Framlingham cart race took place on Sunday. There were lots of Robert Hitchams pupils taking part in a fantastic event. Each cart raced down Market Hill and were timed with a police speed gun. The quickest carts got up to 27 miles per hour. Some carts were designed for speed but as you can see from the picture below - some were just amazingly creative designs which could still win prizes. Watch this video below of some of the races.